There are several conditions which result in a patient being unable to use one of his/her arms. It may be an injury, such as a fracture of the humerus (broken arm), it may be as a result of corrective surgery to the shoulder. These notes are aimed at helping to inform and prepare for the consequences of this. Pain relief: The first big problem that you will have is pain and this can be divided into pain during the day and pain at night. It is extremely important that medications are taken to reduce pain and that the arm is held still or supported on a pillow or pillows to prevent movement, which tends to make the pain worse. As a general rule, painkillers must be taken regularly and re-started before the pain becomes significant. Painkillers always have side effects, for example, painkillers including Codeine which are Codeine tablets or Codydramol and Cocodamol, will cause constipation. Additional medicine or treatments should be taken to prevent the constipation. Codeine can also make people feel giddy or detached, in which case, it should probably be stopped. For patients taking anti-inflammatories such as Neurofen/Ibuprofen or Voltarol/Diclofenac, may give rise to gastric irritability and should therefore be taken after food. Sometimes it causes diarrhoea. Night pain is a major problem with shoulder and arm problems. The pain can be so severe that it is not possible to get to sleep. Lying down makes the pain worse and it may be necessary to sleep semi-sitting up, propped up on pillows or on a settee. Turning over causes pain and you may wake up in the early hours of the morning with acute pain and an inability to get back to sleep. It is important to take analgesia for this and to accept that your sleeping pattern will be disrupted certainly for a week and maybe longer. Getting out of bed is also hard. Getting dressed and undressed: The next biggest problem you will find is with getting dressed and undressed. For the first week it is simplest to have an oversized T-shirt or tracksuit top and not to put the affected arm through the sleeve but just to pull the clothes over the arm and the sling. The good arm will of course come through the sleeve. Always put the bad arm in first and then your head and good arm. After a week or so, it may be possible to put on your normal shirts and pullovers. The bad arm is put in first and then the head and good arm. Alternatively, keep on wearing stretchy, knitted type fabrics for the first 6 weeks. For women, handbags are a problem. It is difficult to open a handbag carried on the unaffected arm using the unaffected arm. One solution would be to carry essentials e.g. house keys, some loose change, mobile, oyster card etc. in jacket/coat pocket on the unaffected side. Consider buying a shopping trolley to pull along with the unaffected arm. Your handbag can go in there too. You will discover various activities which are normally done with both hands together, about which you were not aware. These include doing up trousers, doing up buttons, putting on socks and tying shoelaces. None of these is possible one-handed. You either have to have help or use alternative methods. Tracksuit bottoms are much easier. One can get a sock on one-handed with some difficulty, by pulling it over the big toe first and then the other toes. Tucking shirts in, is very difficult one-handed. Putting on a belt one-handed is very difficult. For women, bra’s are a problem. Another major problem is washing. Standing in a shower can be slippery and you only have one arm to stabilise yourself. It may be helpful to purchase a stool or chair to put inside the shower or some sort of seat across the bath. Getting in and out of a bath will be very hard just using one arm. It is also very slippery you have no balancing arm because you are pulling or pushing with the good arm. It’s best just not to have a bath for a few weeks and to stick to a shower. Washing with one arm is difficult. It is hard at first to wash under the armpit of the good arm with the good hand but this improves as mobility is regained. A bar of soap in the good hand is best. One needs two hands for gel. Be very careful when washing below the knees. Drying oneself one-armed is also very hard and initially you will certainly need help with the use of a towel. 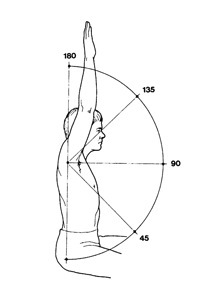 There are various things which are quite hard to do with the non-dominant arm if it is the dominant side that is affected. These obviously include writing, use of a razor for men and putting on make-up for women, dealing with contact lenses, eating, use of a keyboard and a computer mouse. With one arm, one cannot cut up food so one has to have food which can be eaten with one arm or have it cut up. In principle the first ten days are the worst and things get better with time. Expect also to be very tired, particularly if you are not sleeping well at night.